Our team recently completed two Research & Development (R&D) claims for an architects practice in Scotland, resulting in a client saving of £27,501! During the 16 month R&D claim period, the company undertook some ground breaking design work relating to infrastructure projects in the UK to create some highly innovative solutions. The detailed design work elevated the practice to one of the leading providers of infrastructure solutions in the UK. We have a 100% success rate for R&D claims, every claim submitted having benefited the claimant company. 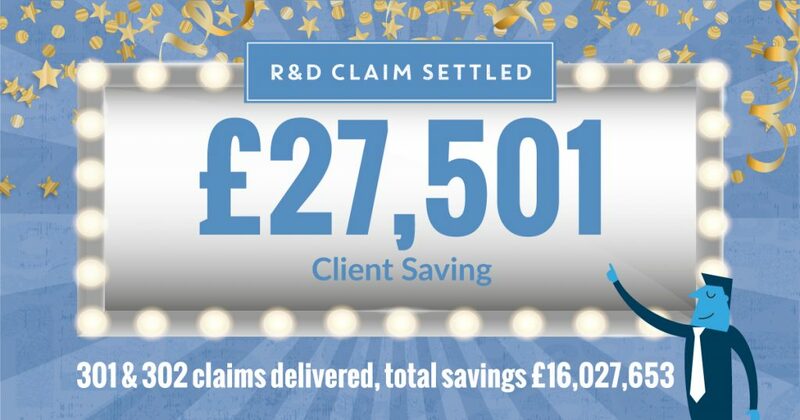 We have now completed over 300 claims and saved over £16 million for our clients, through a proactive approach in identifying and completing relevant claims. We can assess your eligibility then prepare a claim for you, if relevant. Your involvement need not take more than three or four hours and the benefits can be huge.